Instead of writing "stand alone" reviews for some of the books I've been reading lately, I thought I'd just publish some "short takes" (as we refer to them on 5 Minutes for Books). I was gifted with a copy of The Silent Seduction of Self-Talk and this was one I thought I wouldn't really get into because it would be all about having low self-esteem and needing to know how God feels about you. Not saying those types of books aren't healthy and needed, but I am saying that those types of books typically don't appeal to me. I have a healthy dose of confidence and so I'm generally not out there looking for more. Interestingly enough, my problem with over confidence was what Shelly Beach addresses here in this book. She spends the first few chapters talking about her own go-gettum', full speed ahead attitude and how she has to speak the truths to herself that God can actually handle her problems. He really will follow through and care for her needs. With brutal honesty, she shares about how her thoughts can lead her to think more of herself and less of Who God is and what He would like for her to be. While I thought this book would miss its mark with me, instead it hit the target with a nice bullseye! Furthermore, I thought the name Shelly Beach rang a bell. I read and reviewed Hallie's Heart over at 5 Minutes for Books which was written by the same author. It was nice to read a piece of her non-fiction to find out more about the author herself. That was kind of a fun discovery. I took a copy of The Last of the Really Great Whangdoodles along with me on vacation a bit ago and got about 3/4 of the way through it. I wanted to like it. Really I did. I liked Mandy, which is also by Julie Andrews Edwards and which I also read at the suggestion of Jennifer and Amanda. I know Whangdoodles is a favorite of Amanda's but I had a hard time tracking with it. I got to the point where they entered into the magical land and I'm not sure if it was the political statements that I was reading between the lines or what - I just failed with this one. So Amanda can leave me a negative comment and/or tell me why I really must finish it. But at this point - I haven't. Lastly, I am reading Seasons of a Mother's Heart, by Sally Clarkson along with some other ladies that I know here in town. Of course, I can't read a book and not talk about it on the blog. Sacrilegious! Anyway, this week we're meeting together to watch the video series of the same title and discuss the first chapter. I'M READING THIS BOOK SLOWLY. IN PIECES. BY CHAPTER. OVER A PERIOD OF TIME. Well, maybe. I may just go ahead and plough through the whole thing in one sitting as is my habit and nature but we'll see. I will try very hard to be good and go slowly with this. But no promises. It's fun to be part of a group again talking about something I care about - being a mom! This isn't my first "book club" (because it really isn't that) but my first "mom's devotional group" I guess we'll say. It's a good fit for where I'm at right now and I'm excited to learn, not only from the experience but the other ladies in attendance. We'll see how this goes! Ha ha--I haven't read the Whangdoodles either, so I'll have to ask the grown-up 6th grade Amanda what her thoughts were on that (because I think she first read it in 3rd -- maybe 4th -- grade). 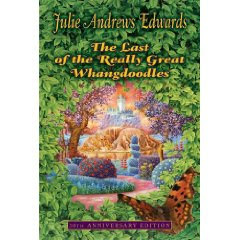 I loved Whangdoodles as a kid but when I re-read it recently as a read aloud to my son I too found the underlying agenda distasteful. Great review of my friend Shelly's book. I'd love to hear your comments on my new book. Check out www.angelablycker.com Thank you for being a thoughtful reader and intentional mother.